I'm a old time cz20 user. I loved that machine and I also like the new cz21 except for the new pinpoint button. I hate this button. I never know if it turns on or off. Sometimes it activates and sometimes it don't. I picked up a used CZ21 Aug of 2015, and as of July 2016 I have used it for both land and water hunts. It is a great water machine, and easily hits coins 10 to 12 inches in the water and on the beach(fresh water). On land, it hits deep, but I only dig strong signals. It will easily hit coins at 8-10 inches. I have a number of machines that have digital screens for target IDs but I still have to say that the CZ21 is my favorite all around machine. There are only two VLF water detectors to consider, the fisher CZ 21 or the Minelab Excalibur. These are the two top dogs. Performance wise they are comparable. I went with the CZ21 because it's built like a tank and is less prone to breakage. Only having 3 tones makes it easy to use. I generally run it on auto tune all metal mode for maximum depth then switch to discrimination to identify target. Use fisher chess harness and just swing a bare pole with a coil. Works for me. Also, fisher labs service is outstanding! Fast turn around time and located in the USA if you should ever need it. If it sounds like I love this detector and company it's because I do. I bought the CZ 21 detector with the 10.5 inch coil and soon after acquired the same detector with the 8 inch coil. To my surprise, the 8 inch coil hit a buried quarter in a test garden deeper than the 10.5 inch coil. The 10.5 inch coil could only hit a quarter at between 8 and 9 inches whereas the 8 inch coil hit the quarter at 11 to 12 inches. I called Fisher Research Labs in El Paso and was told by two technicians in the repair department that this was normal for the larger coil and that if I sent the unit in for repair it would be sent back to me as being normal. I asked to speak to someone with more knowledge and was given the designer of the coils to talk with. After two calls not being returned, I posted online about the incident. The engineer quickly responded online but still did not return my 2 calls. He dismissed the problem stating that he was only an engineer and had nothing to do with other departments even though he stated that the larger coil should have hit deeper than the smaller coil and that there must be something wrong with the unit with the larger coil. He refused to help with getting the unit fixed and referred me to call customer service without adding an extension or number to call. Obviously, service with this company is not good and when buying a product, service can be as important as the product itself. This machine works great and is silent in the saltwater or the wet sand. IMPORTANT.. .. . digging a lot less, is an excellent and easy to use metal detector. Once you learn to use it, you will do very well. Is fantastic beach hunter that I am going to keep forever. My 3rd detector and I like it. After using a PI for half year I purchased the CZ 21 with 8" coil. I really like the discrimination ability. This machine seems to go as deep as my PI. My PI has a 12" coil which is very hard to pinpoint and control in the surf. I am finding more with the CZ 21 and digging a lot less. The CZ 21 also finds the small gold and silver. I found one small silver ring maybe 20" down in dry sand at a well worked site. This machine works great and is silent in the saltwater or the wet sand. The battery life is long. The three different tones are easy to here and always correct. The pin pointing button takes a little time to get the hang of it, but works nice after you learn how to tap it and it pinpoints very well. Easy to ground balance. I really think it will be the only MD I use from now on. Nice shaft and headphones come with it so no extras to buy. I previously owned a whites dfx for seven years paid $1200 for it and I never grasped the complex and difficult settings on it. The fisher is a much better detector and easer to use. 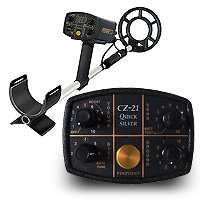 The cz21 is a very easy machine never disc mode more then 3, then you will mis to much. It works always good in water at land at coast just wonderful. The pinpoint button is not easy you must learn to use it. I have always the ground and sensetifeti on 10, never have problems . Very small gold you will not find, but for that you will have no problem with ground control. I rebuild the chest belt, wear it without neck belt just around the middle. The depth is OK but not very good but good enough. Good but not see gold chain and small gold ornaments. I have selfmade VLF 2 freq 7 and 14 khz micropocessor MD. Sensitivity CZ-21 in all metal mode is much better my MD, but selfmade MD see small gold ornaments and chain at 14 khz, CZ-21 dont see.